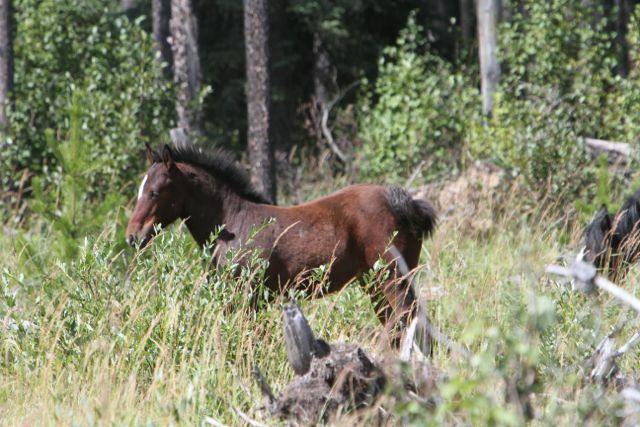 Summer is passing quickly and the wild horses are quickly preparing themselves for the next season. 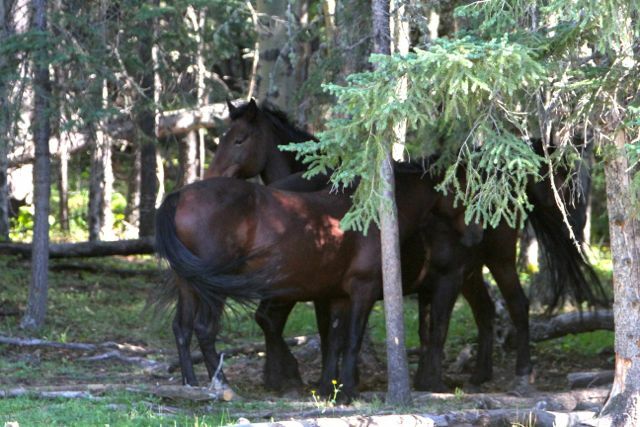 With the September long weekend over the woods and wild horse range will quieten down. This year despite the rains of June, brought more people than ever out into the forestry to camp and run their ATVs. You can always tell this, as the other wildlife and the wild horses disappear into the more remote valleys and deeper wooded areas to seek a respite from all this noise. They also do this “treeing up” to get away from the bugs and heat. Standing in opposite directions to allow for the others’ tails to help keep the flies away, these three young boys relax for awhile. The wild horses are in good shape this year. As a result of all the rains, the grasses were extremely abundant and lush. No matter where we travelled the meadows and woods were covered in thick forage for all the wildlife. 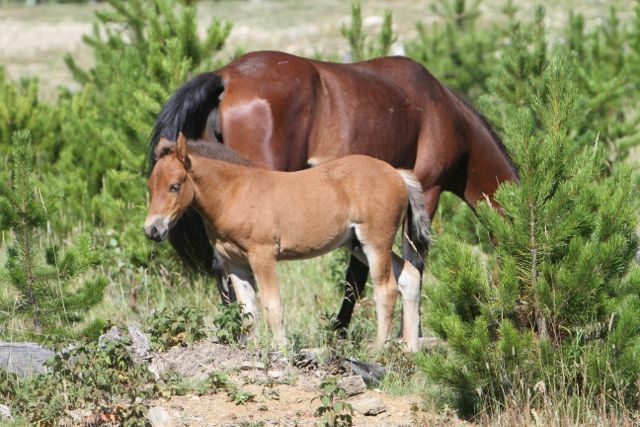 Despite this however the survival rate of this year’s foal crop was only around 30-35%. Many young ones succumbed to the wet conditions in the early stages of their lives. As we travel and visit the bands of horses, it stood out that most did not have any foals with them. Add to this, that last year was the same and the number of yearlings with the different herds is down drastically. Sad yes, but this is part of nature and a reason our wild horse numbers do not have to be reduced by human interference with a capture season this winter. We were fortunate last year that the ESRD responded to public pressure and did not have a capture season. There is talk however that plans are in the works to have one again this coming winter. WHOAS is still advocating that we do not have a capture season for a couple of more years. We want more in depth studies to be done to find out how many wild horses the range can sustain and what affect the horses, if any, do have on other wildlife and the cattle who utilize the same areas. 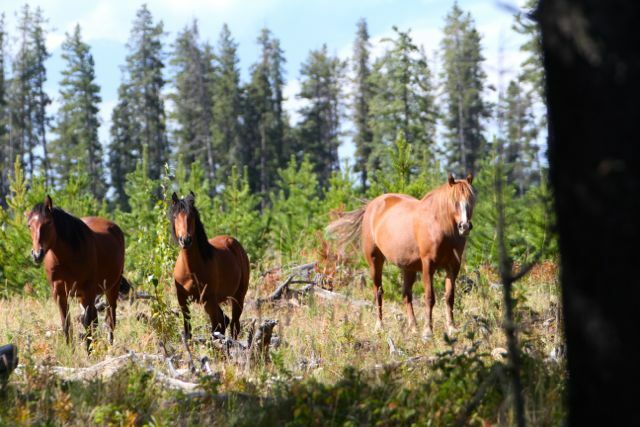 The ESRD is going ahead with their plan to establish a steering committee of stakeholders on the wild horse issue and their effect on the environment in the forestry. A meeting is scheduled for this month to step forward with this plan and WHOAS will be there to represent the wild horses. Wholesale capture of hundreds of wild horses is not necessary, for as you can see Mother Nature, with her weather and predators, does an effective job in controlling the population of horses. Our wild horses need to be recognized for what they should mean to us as Albertans, with our western culture and heritage. and the part they play in the ecosystem as it exists in the Alberta foothills. They do deserve to be protected and they deserve to be able to roam free and wild. 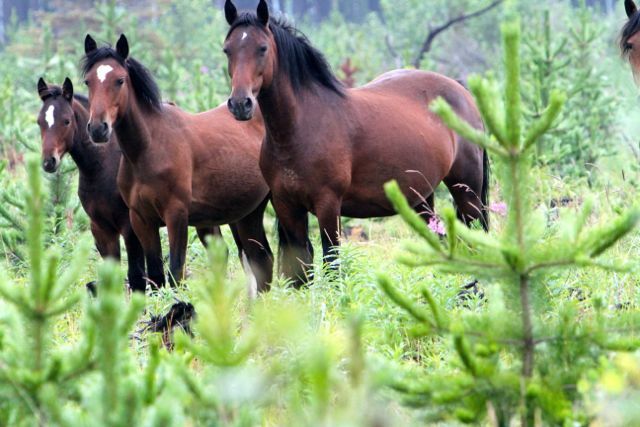 Also just a reminder that our 2014 Wild Horses of Alberta Calendar will be available in October. Again this year it will be 14 months, so that you can use it right away and it showcases some of the wild horses we photographed this past year. Book yours now by mailing your request to WHOAS, Box 70022, Olds, AB., T4H 0A3.